Richard McMinn, who is to resign after two and a half years as Banbridge Rangers manager. Banbridge Rangers boss Richard McMinn is to step down. The club conclude their season at home to Fivemiletown tonight (kick-off 7.30pm) and the game will be McMinn’s last as manager. He has been part of the club since it was formed in 2005 and took over as manager in December 2013. “It certainly wasn’t an easy decision to step down from a club that I suppose has been near part of my DNA for 11 years,” he said on the club’s Facebook page. “I’ve had wonderful times and step down without any regrets. “I’d like to put on record my thanks to all the players both past and present, all those who helped me over the past few years in the backroom staff and also our splendid supporters. “Finally to the committee and in particular John Patterson who as chairman has given me superb support. Also a former club chairman, Richard took over the reigns with the club rock bottom of Intermediate A and saved them from relegation into an eighth place finish. The following season saw Banbridge Rangers spend an extended period at the top of Intermediate A and an 11 game unbeaten run. This current season saw expectations rise even further with several key signings at the start of the year but in the months prior to Christmas the team couldn’t buy a win with an unprecedented amount of injuries. In the second half of the season optimism returned with a superb run in the Marshall Cup which ended at the semi-final in the cruellest of circumstances. 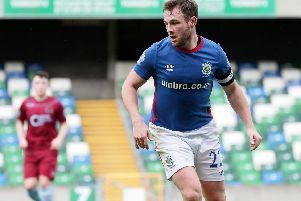 In his playing career at Banbridge Rangers, Richard made 254 appearances (third highest in the club’s history) and has scored 54 goals (fourth highest in the club’s history). Now after 102 games as manager, Richard will take a back seat to concentrate on family and work commitments.